The World Karate Council was formed to give a more defined explanation to the now much used generic term "kickboxing". What is kickboxing? The name means many things to many people. But is does not explain the type of competition fighting that is practised today. 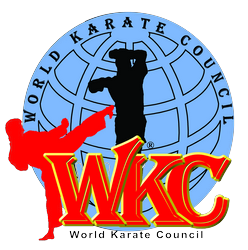 When the W.K.C was formed back in 2008 the initials W.K.C stood for World Karate and Kickboxing Council. The W.K.C practised kickboxing on mats. The term kickboxing also causes problems for fighters that belong to more than one world organization where some ban their fighters from taking part in other world organizations promotions. Therefore the World Karate Council was initiated to allow kick boxers who fight in Points Karate, Semi Contact, Speed Fighting and any other offshoot of "stop start fighting". plus light contact, to participate in W.K.C events without causing problems for them outside of the W.K.C arena. Add to this the very healthy arm of the W.K.C. 's Kata & Forms Division. Covering all aspects of Competition demonstrations. And encompassing many different styles of Martial Arts. The World Karate Council just like its sister body the World Kickboxing Council interact and liaise with one another to produce top class tournaments and competitions around the world. The W.K.C. 's motto "Where the Competitor Comes first" is still the supreme mandate. The W.K.C has grown to epic proportions in just a few short years for one single and most important reason, it follows the old show business dictum of give the people what they want, For years World organizations have been continually putting up their fees in both memberships and world entry level to compete in tournaments. The W.K.C came along and changed all that. The W.K.C does not charge an annual membership fee to its representatives around the world, No joining fees either. It only promotes one president /representative in any country, that person has sole rights within that country to promote the W.K.C. W.K.C World Championships start fees have not changed in four years. Nor are they likely to. Competitors at W.K.C World Championships do not have to pay for programmes or timing schedules. For the last three W.K.C World Championships competitors have received free give a ways. Part of the concept of the W.K.C.’s growth is that it will continually move forward and strive to improve every aspect of its infrastructure. It will also examine developments within sports science and sports safety. Thus ensuring that in future years the W.K.C. and its member countries will keep on growing from strength to strength. And it will strive to be a continuing source of inspiration to all of it's members in the nations of the world and in keeping with the spirit of brotherhood of the martial arts. It has become evident to everyone, that the W.K.C is all about the Sport and the Passion within the Sport. Fair play to all competitors is a prime essential and we do this through only using fully qualified and experienced Judges and Referees. Costs kept at a minimum for competitors and spectators alike. But most of all to bring the sport back to being Fun! The W.K.C. can boast of being the only Sanctioning Body for mat sports concentrating only, in Points Karate, Light Contact Karate, and Forms in the world. The W.K.C. also awards its own unique Gold Star to all of its world champions to wear when out of the training hall to show the martial arts world They are world champion gold medallists. This concept is totally unique to the W.K.C. The W.K.C. World Champions Gold Star is for individual achievement only. It not about how many Gold Medals a competitor has won. Only one Gold Star is presented to a Gold Medal Winner each year. Put simply, put bluntly the W.K.C is about going forward with an ideal that many identify with.... Its all about the Sport! Not the Money! Take a look at the W.K.C. Today! "Where The Competitor Always Comes First"